Kudos to all on the great reception! Also, fantastic efforts on ISS and in Dallas Texas yesterday for the Moon Day/Frontiers of Flight Museum contact. 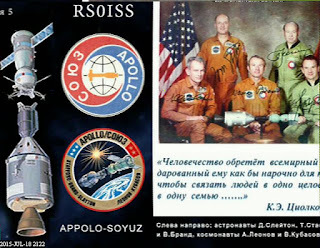 It was fitting to have a US school and the Russian Cosmonauts conducting a joint ARISS contact on the 40th anniversary of the of the Apollo-Soyuz docking. 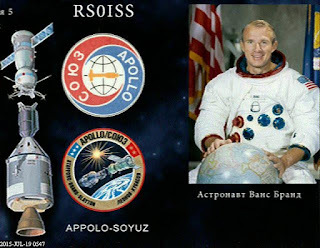 In commemoration of the Apollo Soyuz SSTV event, ARISS will be distributing a limited edition diploma to all that received the SSTV images. If you want to get a commemorative diploma e-mailed to you, we are cordially invite you to listen on 145.800 MHz FM, decode the audio and share your received images with us. The deadline to apply for the diploma is the end of July 2015. Looks like images continued to come down overnight and will run until the scheduled conclusion of the event at 21:20 UTC. Some great images captured by folks all over the world. The following examples should include all of the different images sent during the event. 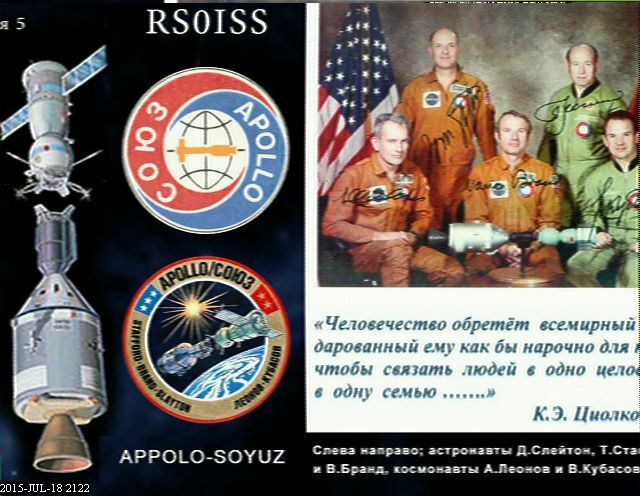 Image above received by UA9UIZ. 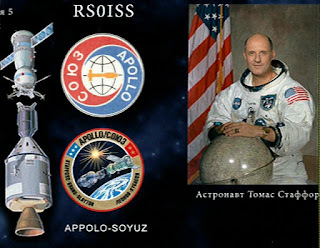 Image above received by CX1TH. Image above received by JF1EUY. 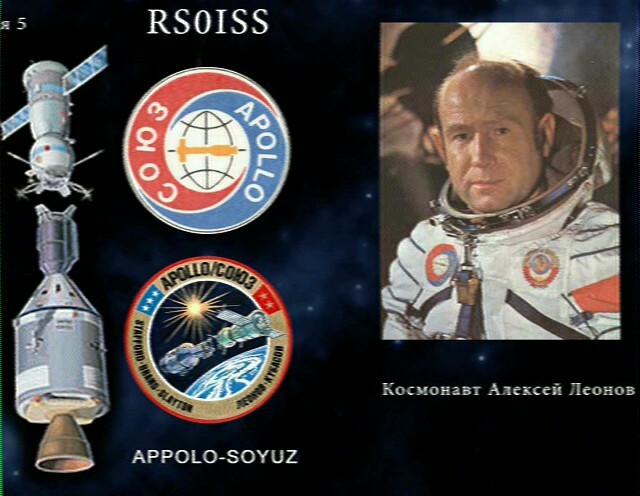 Image above received by 3V8CB. 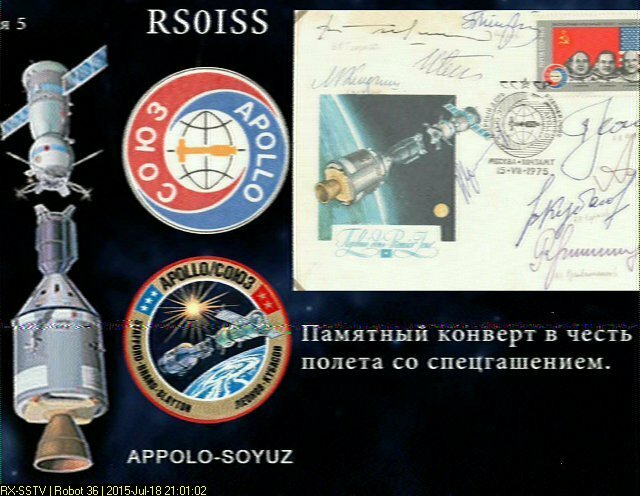 Image above received by HS3ANP. 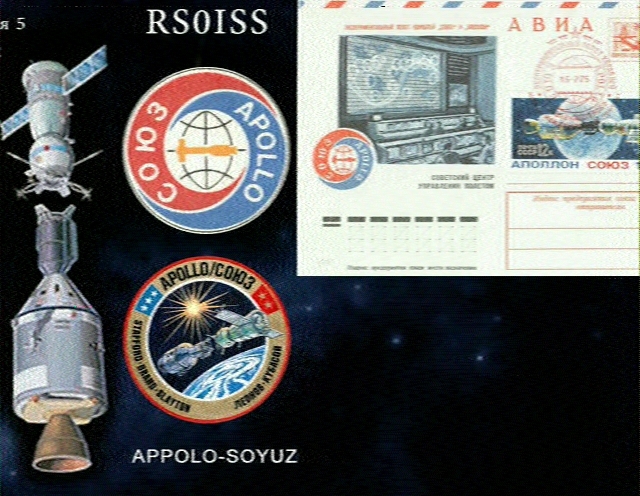 Image above received by LU1DA. Image above received by VK6TGQ. Image above received by IK1SLD. Image above received by PD0RKC. Image above received by PE0SAT. 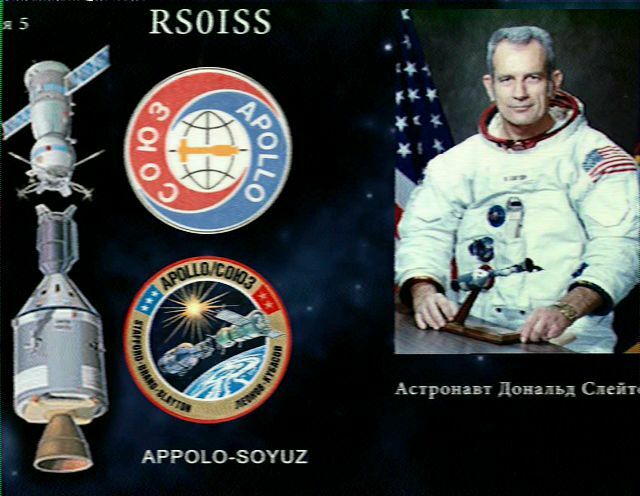 Image above received by CU2ZG. 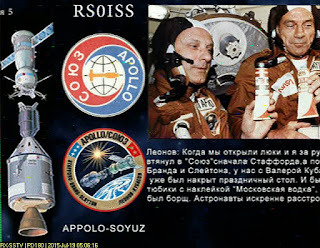 Image above received by WD9EWK. Seems to be a lot of reports of carrier only and no modulation. 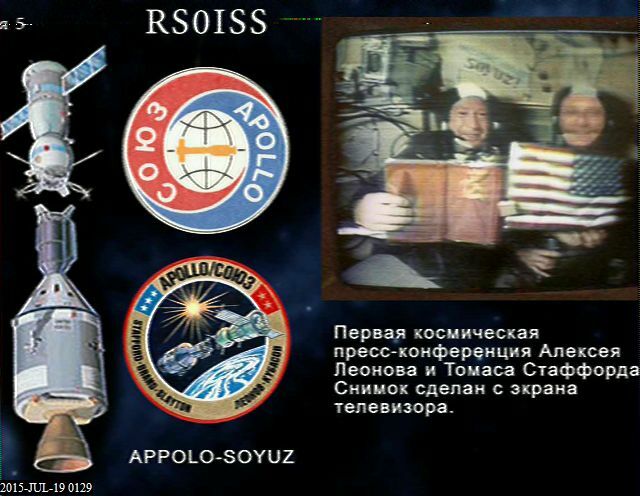 School contact was conducted around 1700 UTC and crew will need to setup equipment for SSTV again. Hope that images will start coming down soon. Images in PD180 received over southeast Asia on 145.800. Hopefully the transmissions will continue until 21:20 UTC on July 19. Good luck. Very Nice image captured over South America by LW8EXS. 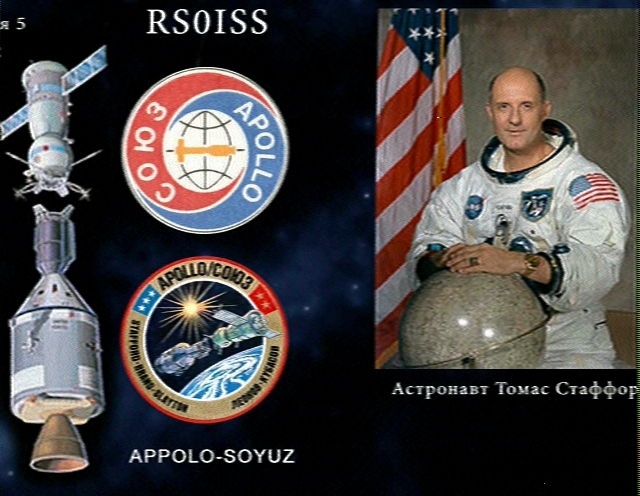 collaboration on the Space Shuttle, Mir Space Station and the International Space Station. The Soyuz and Apollo vehicles were docked from July 17-19, 1975, during which time joint experiments and activities were accomplished with the 3 USA astronauts and 2 Soviet Cosmonauts on-board. Apollo-Soyuz was the final mission of the Apollo program and the last USA human spaceflight mission until the first space shuttle mission in 1981. 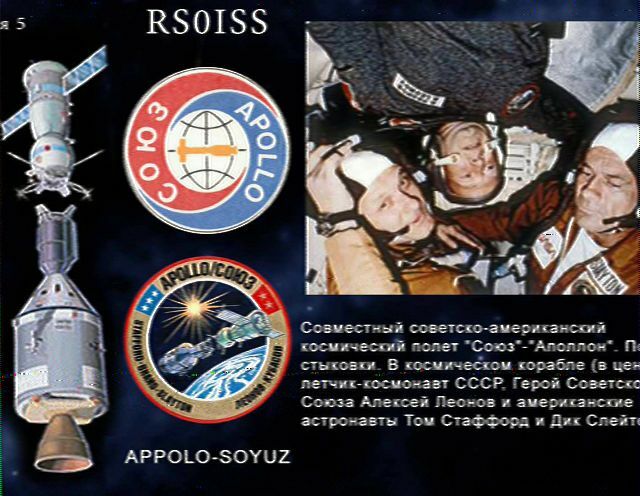 Also, as a special treat, on Saturday July 18 the ISS Cosmonauts will take time out to conduct an ARISS contact with students attending the Moon Day/Frontiers of Flight Museum event in Dallas Texas. 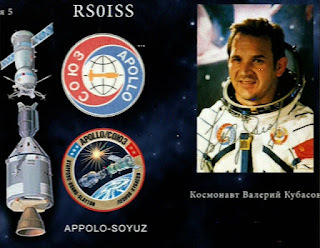 This Russian Cosmonaut-USA Student contact is planned to start around 16:55 UTC through the W6SRJ ground station located in Santa Rosa, California. 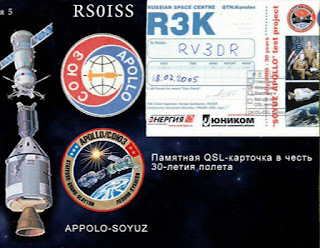 ARISS will use the 145.80 MHz voice frequency downlink (same as the SSTV downlink) for the Moon Day contact. Operational times should be around 10:30 UTC on July 18 until 21:20 UTC on July 19.